This is our review of Walgreen’s Mouth Sore Relief. This product is supposed to help with pain due to canker sores, dentures, braces, or sore gums. It is claimed to have a professional strength that helps reduce the pain of any irritation in your mouth or gums. Continue reading for our full review. Other ingredients include: Benzyl Alcohol, Cetylpyridinium Chloride, Compound Benzoin Tincture, Dimethyl Isosorbide, Ethyl Cellulose, Flavor, Octylacrylamide, Acrylates, Butylaminoethyl, Methacrylate Copolymer, Oleth-10, PEG 6, Propylene Glycol, Ricinus Communis (Castor) Seed Oil, SD Alcohol 38B, Sucralose, Tannic Acid. Benzocaine is a local anesthetic. It is supposed to help the pain by numbing it. The other ingredients are meant to clean and heal the canker sore or any other irritation you may have. It is recommended to first dry the affected area and apply the medication with the applicator. You should allow a few seconds for a coating to form. It should only be used up to 4 times daily, or as recommended by a dentist or doctor. Children under 12 years old should be supervised while using this product. Children under 2 years should consult a dentist or doctor before taking this product. You should close cap tightly after using and avoid contact with eyes. This product may stain clothing and/or furniture. This product should only be used by one individual, meaning don’t share your bottle. You shouldn’t take this product if you are allergic to local anesthetics such as procaine, butacaine, benzocaine or other “caine” anesthetics. You also should not use this product for more than 7 consecutive days. If symptoms don’t improve after 7 days and you experience irritation, pain, redness, swelling, a rash, or a fever, see your dentist or doctor immediately. If this product is swallowed, get medical help or contact a Poison Control Center immediately. 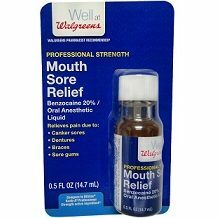 Walgreen’s Mouth Sore Relief is sold for $5.49. It comes in a small bottle of 0.5 fluid ounces. This is a very affordable price for something you may only need to use occasionally. Their return policy allows you to return the unopened and unused product within 30 days of purchase. You must have a receipt. If you don’t have a receipt or it’s after 30 days, you will receive store credit. There are a couple of positive things about Walgreen’s Mouth sore relief. It is an affordable product which won’t cause you to lose that much money if you find that it is ineffective. Some customers felt that this product was able to give them quick relief. One customer said that it really helped with the irritation that braces caused the inside of them while also not having such a terrible taste. There were a couple of things we didn’t like though. The return policy doesn’t allow you to try the product and then return it, which doesn’t give us much confidence in this product’s effectiveness. We also read a few customer reviews saying that this product only worked when they first applied it but the effects soon wore off. We feel you will be able to find a better product out there that will be more likely to get the job done.